With IP67 level of waterproof performance, hand washing, rain. There is no fear of water environment. 1.3 inch IPS screen, 240*240 resolution, super-definition display effect brings you different visual experiences and shows you more data. Heart Rate Monitor & Sleep Monitor – Adopted newest HR sensor for accurate and effective heart rate monitoring to help you do exercise scientifically; accurately monitor your sleep quality every night, help you better track calorie burn. Pedometer and GPS tracker, it can track your activities, achieving all-day real-time location tracking, connect the device to your cell phone APP can show the run stats speed configuration. Built-in 300mAh large-capacity battery, low-consumption chip further improves standby efficiency. Charging time about 3 hours, working time reaches 5-7 days and standby time reaches 15 days. Apply to Android system 4.4 version or above; iOS system 8.0 version or above. Support BT with 4.0 version. 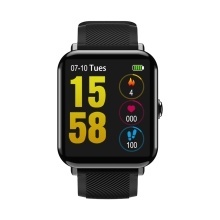 Multi-functional: Heart Rate Monitor, Pedometer, Multi-sport Mileage, Calories, Sleeping Monitor, stopwatch, Hands raise light up, Remote Camera, Sedentary Reminder, Find my device, Alarm Clock，Take Medicine Reminder.